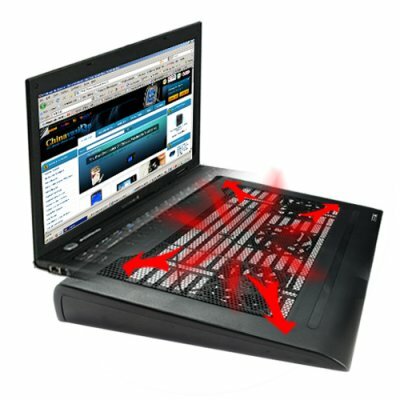 Successfully Added Premium Notebook Computer Cooling Pad to your Shopping Cart. Premium laptop / notebook cooling pad with 3 fans and 4-port USB hub. A product to allow you to work comfortably from your deskspace and keep your computer and yourself cool and well connected. You'll be the coolest guy at the office with this top quality USB powered cooling fan for your laptop computer. This cooling pad features a sturdy case design with three individual fans, two of which can be individually position adjusted to maximize the cooling power and target your hot spots. This is a full sized unit, able to accommodate all of today's popular notebook computers. In addition, the pad includes a four port 2.0 USB hub, allowing to chain in additional USB devices, great if you have a laptop or netpad with a limited number of USB ports. Want to do your loyal internet customers a favor and at the same time make yourself a nice profit? Then order stock of this wonderful Notebook/Laptop Premium Cooling Pad now; this is the type of word of mouth product that is destined to quickly grow in popularity. As always, brought to you by the original direct from China no M.O.Q. (no minimum order quantity) wholesaler, Chinavasion. Premium cooling pad that is big enough to comfortably accommodate almost all of todays popular sized notebook computers. Also includes a four port USB hub for chaining additional USB devices to your computer. There should be under long-term use of notebook, with the hot weather. Convenient for use on a desk or lap.